Think about a sunny day, the first one after winter. Imagine a Sunday you don’t have to work. My first time at the Antique Market started like this, with the normal weekday alarm clock switched off. You open the wood window-shutters and you realize that spring is almost here. There is wind, but all you can think of are blue skies. The rest of the stressors run away into the background. We walked as if we hadn’t anything to do all day long. 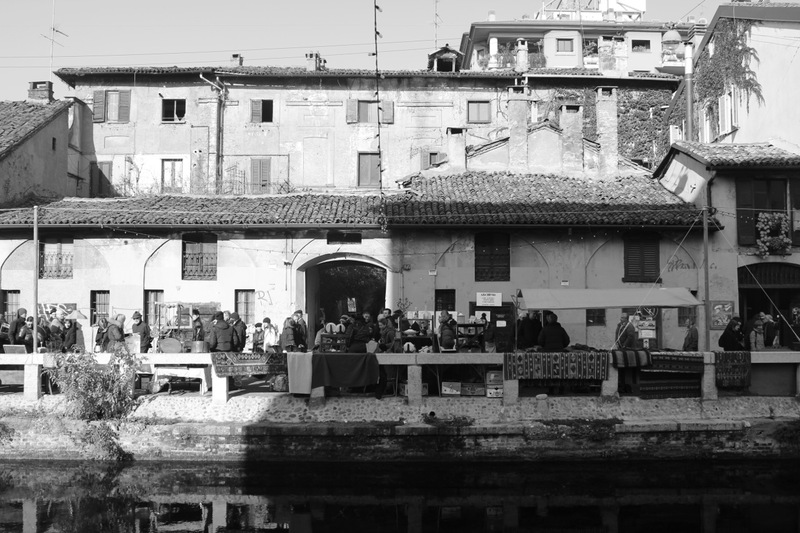 We arrived Navigli – a district in Milan with waterways crowded with shops, restaurants and bars. Friends kept talking about a place, a brand new must-go, where finally Milanese people can eat NY style hamburgers. Tizzy’s is a minimal black and white restaurant, resembling the stereotype that Italians have of American diners. The owner is a blonde woman, with a bold American accent yet speaks a solid half Italian and half English. In Milan there wasn’t a place like this before Tizzy’s, working on the idea of American food without the attempt of making it look more Italian. Tizzy’s is international, filled up with non-Italian clients. We got there early, about 1pm, and found two seats at the counter. After having waited for quite a while for our food, our two hamburgers arrived in black and white paper baskets and two french fries little buckets. Food is fine, not excellent, simply fine. Tizzy’s is the place if you are craving a hamburger and a side, or if not the food, the feeling of being in an international place. My experienced made me nostalgic of Shanghai and its flavor made me “home” sick. Since moving back to Milan after a year affair with Shanghai, this is the first time I discovered such an atmosphere making Tizzy’s a unique memory for me. After having enjoyed this blast from the past lunch, we literally queued to the crowd walking slowly to the Sunday antique market. Every dealer here is very passionate about stuff they’ve collected for all their life. You can find affordable furniture, earrings, sunglasses, board games, typewriters, dolls, and chairs. A pair of vintage glasses costs 40 euro, earrings 20ish. Though not as cheap as flea markets, the antique market offers a wider selection for vintage lovers. Unluckily, last Sunday was really windy and many objects fell inside the waterway from their displays. My name is Alessandra, and this is my first post on Herb & Lace. The story is about something very American and something very Italian, a perspective I hope anyone can be hungry about. As I continue my journey documenting my Italy, I want to share stories not typical “Italian.” What would you like to hear? Perhaps about the local kebab places? Or the best Chinese in the city? This entry was posted in Explore, Milan and tagged alessandra, antique, do, explore, market, Navigli, Tizzy's. I can’t wait to hear more about the eating adventures you take with friends, and how each experience ties in with your international background. I wonder what it will be like when I return “home” to San Francisco from my “home” in Beijing.